A final entry here for Saxe-Bearstein. On October 2, 2016 the originator of this blog, Bluebear Jeff Hudelson, started on his journey to the Summerlands. Jeff is survived by his great love Lani. Hello readers, this is Murdock writing from Jeff's desktop. 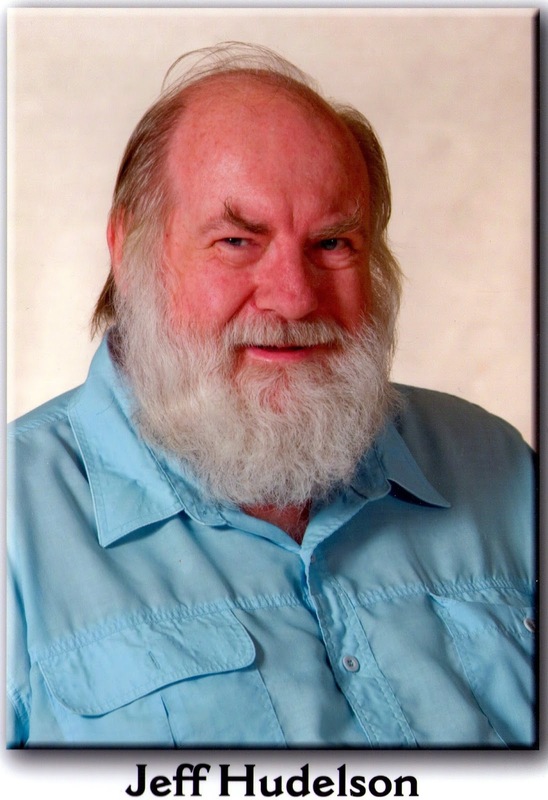 Jeff has encountered more than the usual Gout and had complications from the treatments of the past few years. This has Jeff currently in hospital awaiting hospice availability. While winded from this event, Jeff is still carrying on his jovial talks. Jeff wanted there to be a note to the readers and to assure you all that we plan to continue the games projects. 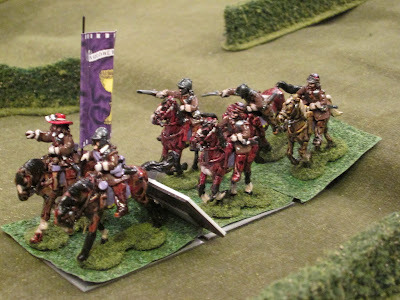 Our 2nd Game of "Black Powder"
Rob and I fought the "Bridge at Kronstadt" scenario from Battlegames Magazine and I have finally posted a few images on my "Wars of Stagonian Aggression" blog (clicky). One of the last units standing at game's end. For other images, go to Rob's photo-account . . . here (clicky) . . . and yes, the guy in red is me. As many of you know, my health has been troublesome the past few years . . . and it continues to be now. Still, with the help of a few "gaming buddies" I have been able to play a variety of times. Last Sunday, Rob and I played our first game of "Black Powder" with two of my "Imagi-Nations", the most worthy Principality of Saxe-Bearstein (cheers welcome) and their vile neighbor, that nasty Kingdom of Stagonia ("boos" and "hisses" appropriate). Here is a link to the battle. 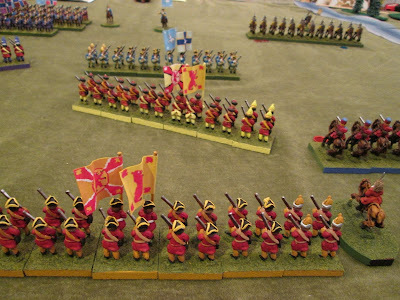 But I have also played some ECW games and several "Lion Rampant" games, as well as a bit of "Pulp Alley" . . . most of which I have not gotten around to blogging about. Anyway, check out our recent WSA battle . . . that stands for "Wars of Stagonian Aggression" for those who hadn't guessed it. Due to my cancer, I am not able to get out much but have played some "Lion Rampant" over the past month. 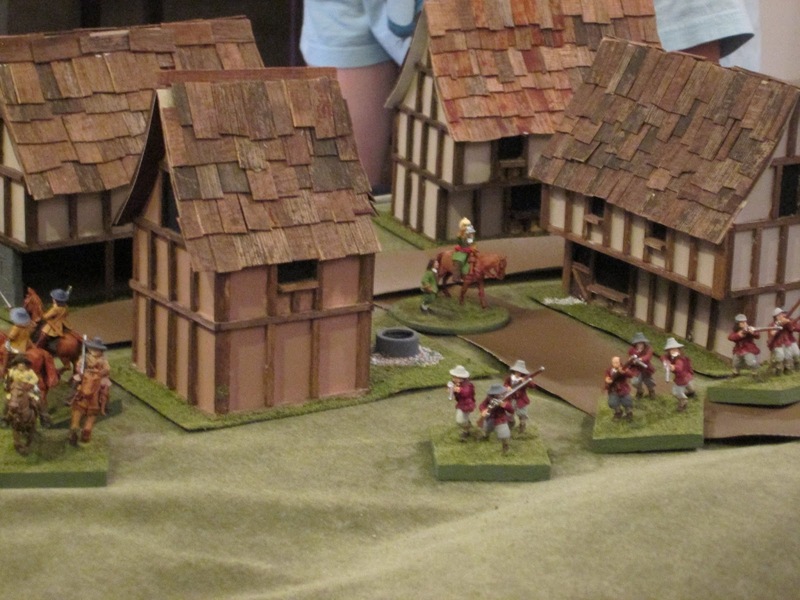 From our third "Lion Rampant" game. 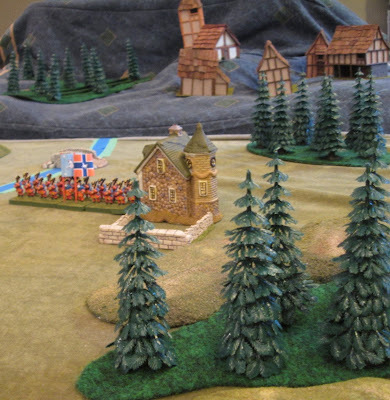 As you can see by the above photo, I use pieces of outdoor carpet to indicate terrain. Dark Green is used for woods; Light Green (upper left) is used for brush; and Gray is used for rocky areas. I think that these will work marvelously, don't you? 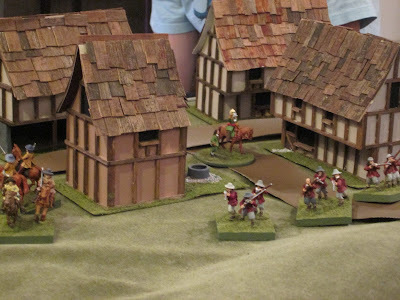 By the way, here is a link to Rob's account of our most recent games. 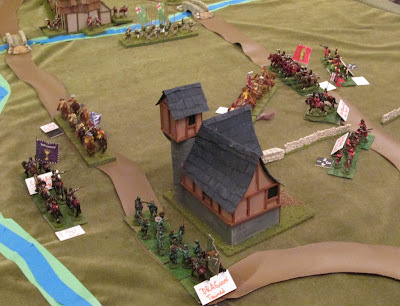 Well, over the past few weeks we have now gamed the "Battle of Whalley" (April 20, 1643) at my home . . . and while I have been too "under the weather" due to my chemotherapy to actually play, David, Rob and Alex managed to fight it twice. Most Royalist troops start at rest in the Town. 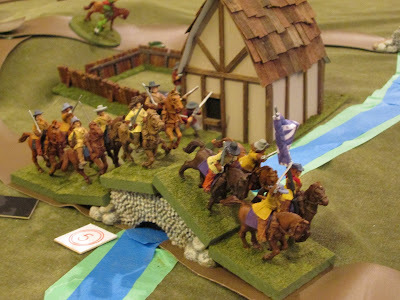 We used the "Warr Without an Enemie" rules from the Wyre Forest Wargames Club . . . including the scenario for the Battle of Whalley (which is included in the rules as well as online). 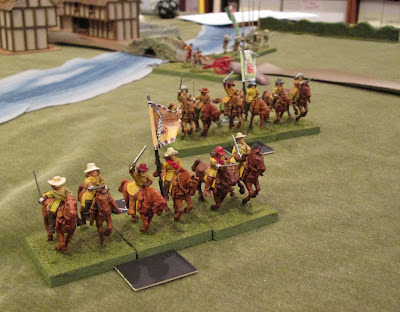 Cavalry with 5 DPs moving over bridge. Above you can see some Royalist cavalry moving over a bridge. The dark rectangle on the left of the image contains its (currently hidden) Orders. The white square with the red "5" indicates that this unit already has five "disruption points" . . . (note that the opposite side has the numbers 1 through 4 on different sides so that it can be used to show how "disrupted" the unit currently is). Because of the "mind fog" that my meds create, I only hosted the games and tried to somewhat follow them. Once my chemo is over I hope to play myself. I will leave it to the others to post their photos and accounts since they were both mentally sharper and are better photographers. When available I will add links to their photos and accounts. From behind Parliamentary lines mid-battle. We finally got around to trying out the "Warr Without an Enemie" rules with their suggested 'learning scenario' a few days ago (i.e., August 3rd). 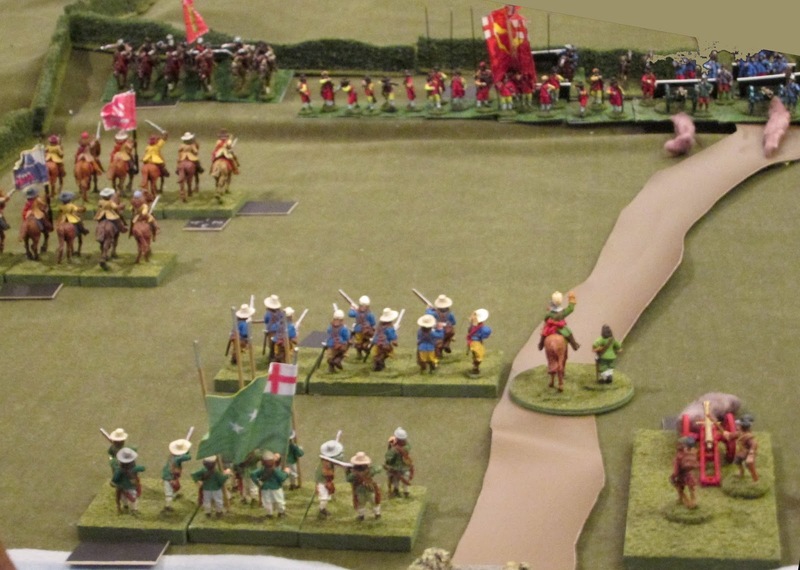 Early action from behind Royalist force. Unfortunately I was unable to play (my chemotherapy leaves me very fatigued), but I was able to host, watch and enjoy the battle as Rob (Royalist) and Murdock (Parliamentarian) battled it out. More Royalist cavalry sweeps out as well. In case you are curious, Murdock provided the the dark blocks in front of units have their orders written on them. He also brought some "Disruption Point" markers (sides marked 1-4 and the reverse side with a dreaded 5). Parliamentarian ponies move up to engage. Sadly due to my medical state I wasn't able to follow the action well enough to recount it here . 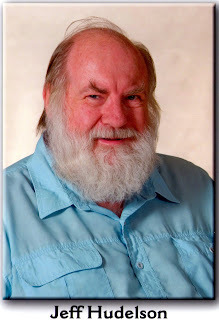 . . but hopefully Murdock will soon post an account (and much better photos) on his blog. . . . (which he has now done). 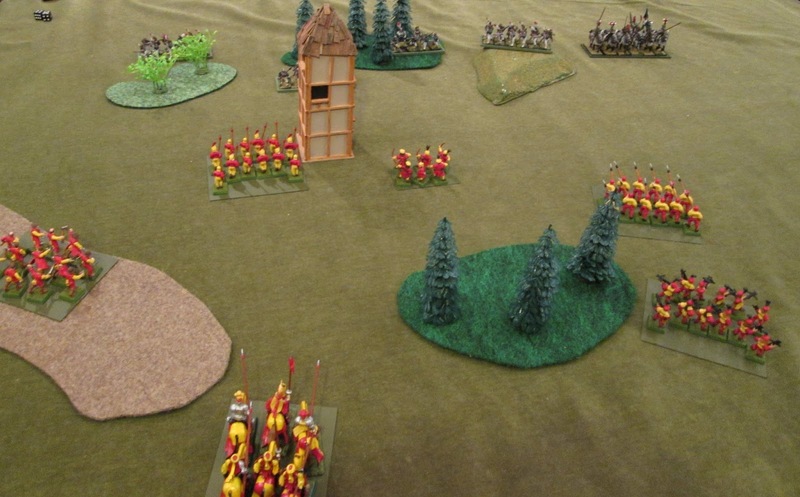 In addition, as of August 16th, Rob has posted his account and photos of the battle here. 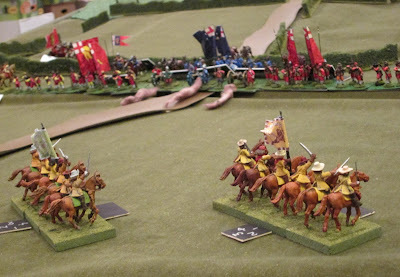 Trying to flank the Parliamentarians. As I mentioned earlier, I wasn't in condition to record the game BUT I do recall our all liking the rules. For me (and I think the others) the main attraction was that the player is challenged to make lots of choices during the game. I know that we also felt that the mechanics encouraged period results. So the overall result of the night was that we will definitely play them again. Oh, and the results of the battle? . . . I think that I will leave that to Murdock to write about. . . . (which he has now done).